If you are curious about caring, grooming, or feeding you lizard, we have everything you ever wanted to know and all your questions answered below. Read on to learn more about these quite creatures including monitor lizard facts. What Are Physical Traits of the Monitor Lizard? There are at least 50 known species of monitor lizards, with new ones being discovered all the time. Some have been known to be as small as 8 inches, but most (such as the Nile monitor lizard that has become popular in Florida) can be quite large. They have long necks and sturdy limbs. Their claws are very sharp, and their tails typically account for half of their body length. Most species of monitor lizards stick to the ground, but some prefer to make their homes in trees or near water. Almost all species of monitor lizards are carnivorous, though a few will eat fruit. Why Do Monitor Lizards Move? Monitors move for various reasons. One is to search for food. The second is to find shelter from the heat or to sleep, and fin basking spots. The third is to run from predators. And the final is to search for mates. Males are most active during mating season. However, their movement may be limited by temperature changes and the need to conserve water. How Far Can Monitor Lizards Move? The daily distance traveled by a monitor lizard varies based on the season, their habitat, and the monitor lizard size. Males tend to be more active than females, primarily because they eat more food (and thus have more energy), and they grow faster as well. Some monitor species will spend most of their time in one location, while others will constantly be in motion. Monitor lizards have sharp and sensitive eyesight. They can see objects from far away and use this advantage to identify pray and keep their distance from predators. Their eyesight, similar to certain types of dinosaur (Tyrannosaurus) is based on movement. Their visual field spans 240 degrees. Do Monitor Lizards See in Color or Black and White? Just like researchers are uncertain about the visions capabilities of dinosaurs in terms of color, scientists, at the time of this writing, are uncertain as to whether monitor lizards and see in color or not. What we do now is that their ability to see in the dark is limited. How Do Monitor Lizards Communicate? Can They Hear? What Do Monitor Lizards Eat? Some monitor lizards have sharper teeth than others. But teeth don’t necessarily make a difference, as monitor lizards will typically swallow their prey whole. The epiglottis prevents food and water from entering the larynx, allowing a monitor lizard to breathe while it swallows its food. A monitor lizard’s teeth, unlike human teeth, are replaced on a regular basis throughout their life. How Well Do Monitor Lizards Retain Water? While monitor lizards can generally retain water fairly well, their overall ability to retain water depends on their environment. Shifts in temperature, as well as climate, will also affect a lizard’s ability to retain water. Monitors that live near areas of water and don’t find the need to retain water as often, have more difficulty retaining water in dryer environments. In contrast, those that that live near dryer areas have a greater ability to retain water. Monitor lizards living in tropical, humid climates, are better able to retain water as the air itself contains more water. Smaller animals, living in dry areas, that are able to hide in burrows and trees, are more successful at retaining water than their larger counterparts, which have more difficulty escaping the dry, arid heat. Monitor lizards’ fork-like tongues allow them to taste the air, which in turn lets them detect movement and prey. Taste buds on their tongues, as well as organs near the tip of their nose, allow them to almost triangulate the location of a small depending on which side of the tongue they are locating a scent. Water monitors also use their tongues to test their prey before consuming it. They can use these techniques both underground and underwater. It is hard to distinguish a male monitor from a female one based purely on physical appearance. Monitor lizards are able to identify other males and females with their sense of smell. The lizards release pheromones, and mark their territory in similar fashion to other animals (dogs for example – by urinating). Monitors can drag their tails to mark their territories, and will use these markings to protect their territory – in particular, food, shelter, and basking areas. They will also mark one another by tasting each others’ heads, shoulders, and pelvic girdle. How Large Do Monitor Lizards Grow? The size of a monitor lizard varies entirely according to their species. Some have long necks and snouts, and some short; some have long necks, and others barely have one at all. Their bodies also vary greatly in size – the largest living monitor lizard is the famous Komodo dragon, which can be found on several islands, including one named after the lizard itself – Komodo Island, in Indonesia. Various factors contribute to a monitor lizards’ size. These include diet and nutrition, climate and habitat conditions. In general, male lizards will exceed female lizards in size. Unlike your standard household pet, monitor lizards don’t need to be groomed. Their skin falls off itself, just like you’ll see with other reptile skins, including snakes. It’s important that you furnish your water monitor cage with materials that will keep the nails trimmed. Unlike dogs and cats, monitors do not require grooming. The right furnishings allow for the nails to keep from overgrowing. Dead skins come off of its itself due to the right furnishings and humidity. For breeding purposes, it is best if the animals are not handled and left to their privacy. Monitors display their superiority by rubbing their backs and or lying on top of them. In holding these animals one finds their skin to be warm and dry rather than wet and slimy. Excuse the pun. An essential part of grooming your monitor lizard involves checking it for parasites. This isn’t something to worry about, as long as they are treated. When you first obtain your water monitor, or if you haven’t done so already, take it to the vet to be examined. The vet will be able to kill the parasites with medications. In general, if you ensure that your lizard’s cage is kept clean, and the lizard stays well nurtured, taken care of, and well fed and groomed (as described above), you will help prevent a parasite infestation from recurring. Do Monitor Lizards like to Be Petted? This all depends on how domesticated they are. If born in captivity, or if a baby monitor lizard is adopted when young, they are easier to tame. Regular human contact will help them grow on you – they typically enjoy being scratched under their chin, on their back, behind their ears, and on top of their head – just behind their eyes. If they start inflating their throats and hissing you’re doing something wrong. If they breathe deeply then they’re enjoying what you’re doing. Dogs may be known as “man’s best friend,” but some people prefer a different kind of companion–one of a scalier variety. An interesting choice for a pet that is growing in popularity in the United States is the monitor lizard. The trend seems to have started in southwest Florida’s Cape Coral area, and from there, the monitor lizard population exploded and spread across the rest of the state. The lizards have even found homes in such densely populated areas as Orlando. Most of us have known a small reptile owner who has kept a frog, turtle, or even an iguana as a pet. Some may even consider these pets to be cute or intriguing, but the fact is that monitor lizards are not that easily domesticated, and they can be dangerous when forced to live in a human environment. While most pet lizards are small and can be kept in a small glass aquarium, monitor lizards can grow to humongous sizes, up to over 7 feet in length. Not only can these animals grow to be relatively large, depending on species, but they can be rather ferocious, to the point where some experts claim they are impossible to domesticate or tame. 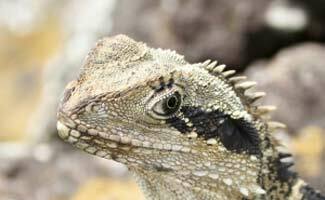 While these intelligent, large creatures have become quite popular in the reptile pet trade, there are inherent dangers to owning them, and they are definitely not suited for the beginner reptile owner. In fact, many would recommend that no one should own one as a pet. As you will see, there are many dangers to owning a monitor lizard. If you are looking for companionship in a pet, a dog or cat may be a better alternative, because bonding with human beings is not generally in the monitor’s repertoire of characteristics. How Do Monitor Lizards Defend Themselves? Monitors are well adapted to their environment and well camouflaged, which helps them avoid potential predators. Snakes are considered to be the monitor lizard’s most feared predator. Young monitor lizards are able to rely on color and behavior for defense – they are more spread out than adults, and they are able to take cover more quickly and effectively. Larger lizard species, with fewer predators on their tail, will simply lie out in the open and cease to move when they spot a predator. However, if the predator comes close, they’ll take off in the opposite direction of the predator’s advance. An adult monitor lizard can go faster than the average human and most other lizards. Once they can, they will hide in burrows, trees, or even under water. What are Monitor Lizard’s Defense Mechanisms? When confronted monitor lizards try to puff themselves up as much as possible, making themselves appear larger and more threatening. They stand upright on all legs, puffing up their lungs, flattening their back, making a hissing sound, and some will also sway from side to side. As a final protective measure they open their mouths as far they can. But will a monitor lizard actually attack if confronted? Yes! If approached, the monitor may lunge and attack. The monitor lizard is much like a momma Lion who’s babies are threatened, in that it will attack relentlessly. When listing the dangers of keeping a certain animal as a pet, the physical dangers of the animal (such as their teeth or claws) are the obvious considerations. However, the most dangerous trait the monitor lizard possesses may be its aggressive and extremely ferocious personality. However, the monitor lizard cannot be tamed. The monitor lizard also knows no loyalty to its owner. While the pit bull may often show aggression toward strangers or anything it deems to be a threat to its human companion, the monitor lizard feels no such allegiance and will violently turn on its owner just as easily as it would on any prey or outside threat it senses. It would be unwise to underestimate the physical danger this lizard poses to anyone it comes in contact with, as it is rather strong and supremely quick. That, coupled with the creature’s naturally aggressive tendencies, must be considered before a monitor lizard is taken in as a pet. Watch this two-minute video to see the monitor lizard and its aggressive behavior in action as it goes after a crocodile’s eggs. Is the Monitor Lizard Poisonous? Many monitor lizard owners share similar experiences with their exotic scaly pets, and Nile monitors in particular will not hesitate to attempt to bite their caregivers. There is no denying that a bite from any species of monitor lizard can be downright painful, as monitors have been known to crush bones in humans. Beyond the danger to the skin, bone, and surrounding tissue, monitor lizard bites are also poisonous, resulting in swelling and excessive bleeding. Experts initially presumed that meat and other bits of food stuck between the lizard’s teeth carried dangerous strains of bacteria, causing such a reaction in those who were bitten; however, it was discovered a few years ago that this reaction is actually the result of venom that is unleashed when the lizard bites. This venom is not fatal to humans, but it can cause illness and pain. The real danger in a monitor lizard’s venomous bite is for small animals or infants. The venom stops blood from clotting, causes a rapid drop in blood pressure, and heightens the pain associated with the bite. Researchers have even found that monitor lizard venom contains crotamine, the same poison found in rattlesnake venom. Though it should be noted that it is present in such small amounts that it is not fatal to humans, it is still a sobering thought. The monitor lizard’s venom acts as a sort of knockout punch to small mammals and birds, so if you have a small child or a cat, dog, or other pet, it would be unwise for you to adopt a monitor lizard. The monitor lizard’s tail can account for more than half of the body’s total length, and the lizard is naturally disposed to use this formidable weapon with whip-like action. When confronted or even mildly agitated, the monitor will whip around with its muscular tail in an attempt to incapacitate its prey or any perceived enemy. When it decides to turn that tail on its human owner, it becomes a dangerous pet to own. This natural weapon makes it easy to see why this lizard is not recommended as a pet in general and why even the most experienced reptile enthusiasts must be careful around such a powerful creature. Considering that the monitor’s tail is capable of breaking the bones of a full-grown adult human and that its aggressive nature can cause the creature to turn on anyone at any time, it is of utmost importance that the lizards are kept far away from other pets and small children. As we’ve already established, if you have small children or are planning to, a monitor lizard is not a wise pet choice for a variety of reasons, but there are other considerations as well. Most people are aware of salmonella, a disease that can make you very, very sick. Salmonella is a broad term that can encompass over 2,000 different kinds of disease-causing bacteria. You may think of it as something caused by bad food or an unhygienic lifestyle, but while this is true, reptiles (and other animals) are also major carriers of the disease. Monitor lizards in particular have been linked to a certain strain of salmonella. Several years ago, the Centers for Disease Control (CDC) identified a rare strain of salmonella called S. poano in the stool of an infant. A couple months before this discovery, a baby was brought to the hospital to be treated for bloody diarrhea, flatulence, and a temperature of 101 degrees. A stool sample was taken, and S. poano was found. The baby was treated with antibiotics and made a full recovery, but the doctors were baffled as to the original cause of the salmonella. The parents did not have the disease, and though the child attended a daycare center three times a week, none of the other students were symptomatic. The doctors performed a home examination and found that the only pet living in the house during the time when the child became sick was a python. Doctors examined the snake and found no S. Poano present in the snake or its habitat. However, it was later discovered that a month before the child became sick, the family had been housing a 2-foot monitor lizard. The parents had returned the lizard to the pet store in exchange for the snake because the lizard suffered from chronic diarrhea. Stool samples taken from the lizard revealed it to be the culprit. Though the baby was never allowed near the lizard and only the father cleaned the cage, the salmonella the lizard carried was still transferred to the infant. This was possible because of the method by which the cage was being cleaned. The cage was about waist high on the father, and he had to step into the cage to clean it. He did so in his bare feet, and when he stepped back out of the cage, he unwittingly tracked the disease throughout the house. Another possibility was that the baby contracted the disease via the heat rocks, which the father cleaned in the kitchen sink and possibly caused contamination in an area where the family prepared food. S. poano was first discovered in Ghana, and during the time of this infant’s difficulties with it, the only other reported cases of human infection with that particular bacterial infection stemmed from human contact with Savannah monitor lizards. As dangerous as it is, S. poano is not the only bacteria that monitor lizards carry. Import of monitors from places like Ghana is not carefully regulated, so there is no way to ensure that the lizard you select as a pet is not a carrier of any disease. In most cases, the lizards show no signs of disease themselves, but it is estimated that 90 percent of all reptiles are salmonella carriers. This is another serious danger of owning a monitor lizard, as it is estimated that up to 4 million cases of salmonella are contracted each year, resulting in 500 annual deaths. In Florida, the Nile monitor lizard population is growing steadily. Despite efforts to control the population growth of the animal by trapping and relocating the creatures to more suitable environments, their presence in the state still continues to grow at an alarming rate. This may not seem to be a pet owner’s problem, but it is a direct result of carelessness on the part of monitor lizard owners, and it is a danger to society, particularly because the Nile monitor is one of the largest and most powerful species of monitor. The problem with owning a monitor lizard as a pet often stems from the motives behind it. People often adopt “unique” or “exotic” animals on a whim, assuming it will be something they can talk about or show off to their friends. Surely, owning such an animal is a conversation starter. However, the problem with this impulsive attitude toward ownership of such a dangerous animal (or any animal, really) is that prospective owners do not take the time to make themselves aware of the responsibility involved. What many people do not realize when they purchase a monitor lizard is how large the creature may can grow to be, especially because they are so small when first adopted. The lizards grow incredibly fast; a Savannah monitor has been known to grow from 7 to 44 inches in the course of one year, requiring an 8’x4′ cage, and Nile monitors require double that amount of space. Monitor lizards are also much more difficult to care for than other reptiles. Because of their high metabolism, they must be fed more often than other reptiles. This can be quite cost prohibitive, as the smaller monitor lizards may eat more than $40 worth of food daily, and larger monitor lizards eat much more. Whether it is because prospective monitor lizard owners fail to do the necessary research or because the vendors selling the lizards fail to inform prospective buyers, most people who purchase monitor lizards are unaware of these important facts and of the responsibilities that owning a monitor will entail. Because new monitor owners are unaware of the dangers and responsibilities, they are often caught off guard once the animal begins to grow and behave in its natural way, and they look for a quick way to get rid of the animal. Sadly, the lizards are simply abandoned in local natural areas. This causes many problems for local wildlife, as the monitor lizard is very fertile, and its presence disrupts the delicate balance of certain ecosystems. Experts claim that the monitor lizard is a tremendously fertile breeder. Females are known to lay anywhere between 40 to 80 eggs at a time, once or twice per year. The Nile monitor lizard is a particularly ferocious carnivore and has become a major threat to many of Florida’s endangered species, including the endangered ground owl and the gopher tortoise. Because of the Nile monitor lizard’s appetite for eggs, it is a threat to the alligator and the American crocodile population, as their ground nests make easy targets for the lizard. Due to of all of these factors, the monitor lizard has become a threat not only to their human owners, but also to the natural world in which they are abandoned. They are a danger to all who live in the regions where these lizards are being imported, not only to the natural wildlife that inhabits these areas, but also to the innocent pets, children, and even adults who call these places home. Considering a Monitor Lizard As a Pet? If you are considering owning a monitor lizard as a pet, you must be aware of the very apparent dangers. There is a risk to your health, as well as to the physical well-being of all other people and animals who live in your home and your area. It is not illegal to own a monitor lizard in most states, though many do require a permit to do so, so you are cautioned to pay attention not only to the safety concerns here, but also to the laws in your region. If you do decide to adopt a monitor lizard, be sure you are prepared to exercise extreme caution and that you are willing to keep and care for the animal for the duration of its life, which can last up to 10 years. Learn more about other types of lizards in our archive of additional amphibians articles. Have you ever seen a monitor lizard? The fiction and creative writing show strongly in this article. Ridiculous! They’re not venomous. All reports carry salmonella, not just monitors. You have a prejudice or a serious need to sensationalize you need to get over! You clearly have never had experience with these animals and prefer urban myth to their reality. Retract your misinformation, you’re part of a big problem. Monitor venom?! Show me actual scientific publications that can prove they’re venomous… I’ve been bitten by my monitor a dozen times… Komodos have a nazzzty bacteria kid in their mouths that will eventually, if untreated, kill any other creature. But they’re not venomous. Stahpit. My Savannah Monitor has ecaped and is in deep hiding…can find him.put out water..loud smelly food(eggs,meat) and heating lamp all out in middle of my apt. But he isn’t moving around or I’d hear him. My cat keeps watching the couch and the open faced closet behind the couch. She knows he is somewhere in there. Please help me get him to come out? I’m out of ideas. He is7-8 months old approx.18-20 inches long and he hasn’t ate or took water in over four days now. Thank you. Monitors are venomous, not poisonous. There is a big difference. Not differentiating between the two causes unnecessary confusion. I saw a monitor lizard inside my siblim bord ,what do I do to bring it out from there, I have applied sniper.wish it can go out of there, what do I do. Hi, I’ve been reading about monitor lizards to see if I might want to have one as a pet. I kept reptiles as a boy and teenager, mainly rat snakes that I had caught and desert swifts I had bought at a pet shop. That all ended when I went away to college. Since then I have had cats and dogs but now find myself living alone in a very small apartment. What draws me to monitor lizards are their intelligence and beauty. I intend to do diligent research for the next year before making a decision whether or not to actually own a monitor lizard. I am much more interested in observing their behaviour and hopefully being able to interact with them. As my apartment is very small, I’m considering Ackie monitors. These are a species of dwarf monitor which can grow to adult size up to about 27 or 30 inches. Could you point me to websites or books with information on keeping these small monitor lizards? I would only aspire to good and responsible animal husbandry. Thank you. Hi, you might like to visit “herpcenter.com”, there are quite a few experienced varanid keepers there who would be most willing to offer you some reliable advise! Hi, there is some quite inaccurate information contained in your article, it`s badly in need of correction (I would be happy to elaborate if you wish)? Sorry to hear and yes if you can provide the information we’ll take a look and update as we want to ensure our articles are as accurate as possible. Hi and thanks for your response. I’ll go through a few points: Varanids certainly do see in colour; they do not possess taste buds on the tongue, it is used mainly as a chemosensory organ, the scent particles are passed to the the Jacobsons organ in the roof of the mouth. Even the largest monitor wouldn’t cost anything like $40 per day to feed!? They do have a relatively high metabolism but in comparison to a similar sized mammal only require quite a small percentage of food (energy) and it`s extremely important to bear in mind that captives will normally receive a minimum amount of exercise therefore the amount of food offered should reflect that, they are prone to storing large fat bodies which in many cases they cannot possibly use causing many health problems (including an early death). Great thanks for sharing will update the article accordingly! My savannah monitors has moved her or his fake tree slowly over the past 4 days from one end of the tank to the middle then the side then next to the cave now inside of the cave why? Hi all…I just got a Nile monitor and I immediately liked owning one but I am not experienced enough to tame it….any tips on how to do that. You don’t. Nile monitors will decide on their own whether to allow you to interact. However, putting them in a densely populated area of your home, not giving them a hide until they calm down a little, having a piece of clothing with your scent in their cage and constant interaction is great. Just remember they are cheap for a reason. A water monitor or even more so a savannah monitor is a much butter choice for a new monitor keeper. Please refer to my youtube channel on Nile monitors. The channel is under Alex Crowder. That being said i do not suggest a Nile monitor as a pet. Its extremely unlikely that you will ever be able to tame it. Even if its “tame” it can and will confuse you for food eventually. Its just how Niles think. They extraordinarily prey driven predators and while they ARE extremely intelligent, they think about very little other than their next meal. Help! I got a rock monitor as a gift. Have had it for 2 days now and I tried giving him boiled egg with no luck. Still waiting for him to eat the pinky I just bought but IT BIT ME! I’m feeling that my chest is a little closed and its harder for me to breath. And I’m struggling to turn my head. Is it because of him or just my imagination? Jannecke, so sorry to hear you got bit and are having health issues as a result. Monitor lizards do have venom that can cause temporary pain and rapid drop in blood pressure but it is not fatal to humans. You might be having a small panic attack as well (hard to breath). Hopefully you’ll get to feeling better soon but if not please seek medical attention or call 911! So for an animal to be venomous they need venom glands. Why bites from monitors and other big lizards is bad is bc of the left over flesh In Their teeth… just like a Komodo dragon they just have a cocktail of bacteria growing in their moth. To my knowledge Gila monsters are the only venomous lizard. I like it. It’s got alot of interesting facts. I’d like to believe my Nile monitor is pretty loyal though. He almost seems to try to defend me from strangers and alerts me whenever there is someone he is unsure of. He may be doing it for his own sake but who knows. He’s also very careful not to bite me during handfeeding. I’ve even fed him live mice while he sat on my shoulder. He’s exceptionally trustworthy. Feel free to check him out on YouTube if you are interested (Buddy the Nile monitor). I take him with me to stores all the time as well although he will be too big for that really soon. He’s only 5 months and over two and a half feet. Are savannah monitor lizards legal to own in AL as pets? Sarah, they should be – just like having any reptile as a pet, make sure they are secure from harming or hurting other animals and humans. But if you are still uncomfortable I would double check with your local laws.